Saturday, October 6, 2018, 9 a.m.–2 p.m.
UPDATE: Registration Form link is not working (9/30/2018). Class may be full. 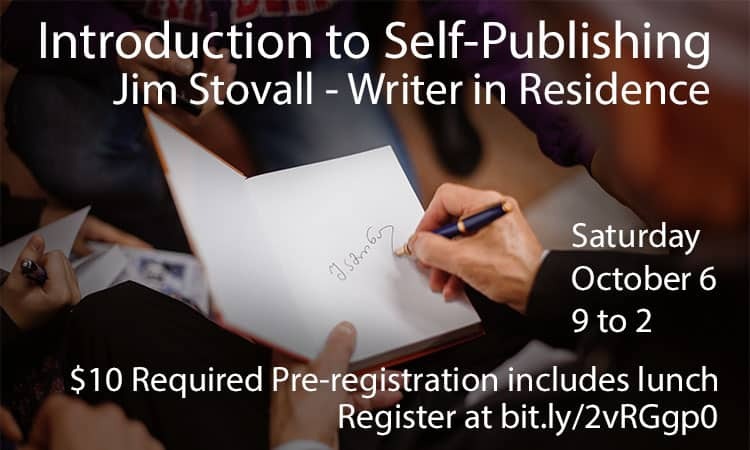 Learn the basics of self-publishing in this half-day workshop led by Jim Stovall, Blount County Public Library’s current writer in residence. Online pre-registration is required. Registration Form. UPDATE: Registration Form link is not working (9/30/2018). The $10 registration fee includes a box lunch from the library’s Bookmark Café. Lunch is not optional, and lunch order options are on the registration form. Seating is limited to 30. For more details, call the Library’s Adult Services (Reference Desk) at 865-273-1428 or 865-982-0981, ext. 1450.